We're fighting back and we need your help. 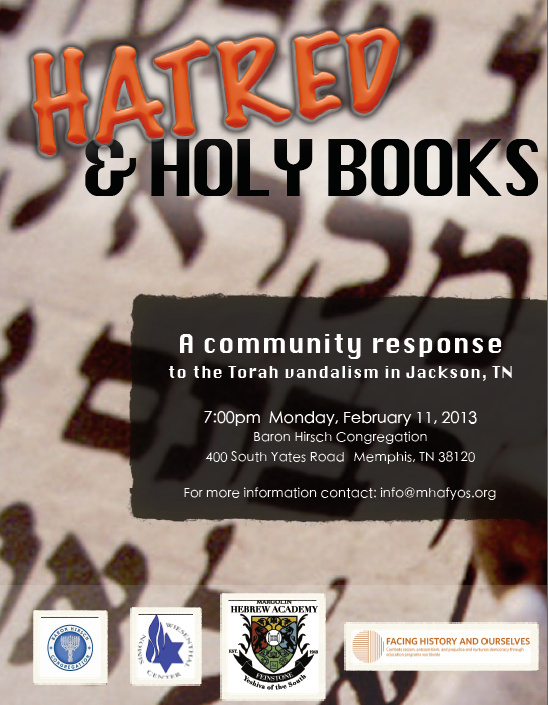 Rather than accept the desecration of our siddurim and our Torah last week in Jackson as an isolated act of misplaced anger, we're reaching out across the community to make a statement to our city, our region, and to ourselves that there is no place for hatred and bigotry of any kind. We are joining hands with Facing History and Ourselves and the Simon Wiesenthal Center for an event being graciously hosted by the Baron Hirsch Congregation, in which we will educate ourselves and others about the kedusha (sanctity) of a sefer Torah and its meaning to our people, while also speaking out strongly and unequivocally against all forms of prejudice and intolerance. 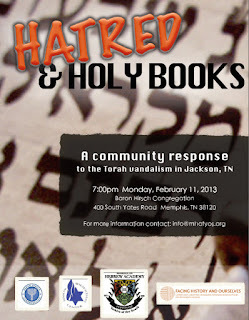 The event will begin at 7pm on February 11th at the Baron Hirsch. Mark it off on your calendars, tell your friends, hang a sign in your office. Let's come out in full force and show everyone who we are and what we stand for.